Still more of a very unofficial site !! This Victorian station was originally located at East Petersburg PA which I believe is not too far away on the Pennsy. Don't know the origin of the caboose. In this set we have a small gasoline switcher and another shot of the M &PA boxcar. An opululent Reading business car compared to the lowly gasoline-powered coach. To me, however it is the coach that is full of history. The Lancaster, Oxford and Southern was a narrow guage part of the proposed Peach Bottom System. There actually was a Peach Bottom, PA town on each side of the Susquehanna near the Maryland border. As can be read on my York PA pages elsewhere (or better yet, George W. Hilton's The Ma & Pa), the Peach Bottom system was a dream to connect the Broadtop Mountain coal fields with Philadelphia by none other than the capitalists of Peach Bottom PA (west shore). Local investors might be excused for not realizing the series of ridges west of the Cumberland Valley that would face such a road, but they surely had to realize the enormous task of bridging the Susquehanna not far from its mouth. 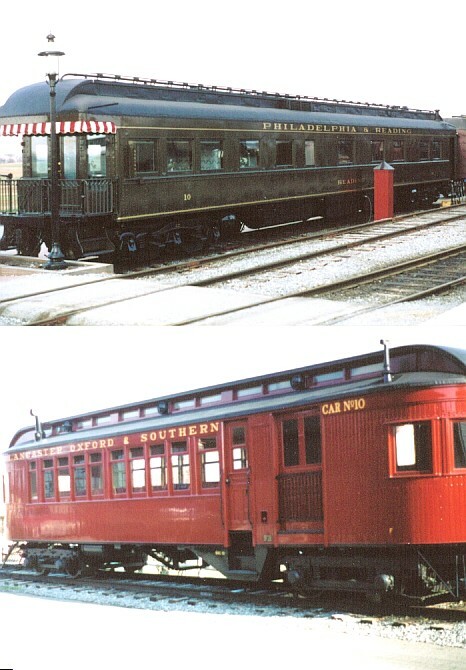 What is amazing is that two sections were actually built, the Middle Division Peach Bottom Railroad eventually became the Pennsylvania portion of the famed Maryland & Pennsylvania Railroad. A somewhat improbable railroad, the M &PA only officially went out of business a year or two ago (this is written in 2003). Lesser known was the above mentioned LOSRR. The LOSRR gets my attention because this railroad ran a locomotive built in Mt. Savage Maryland, near my old stomping grounds, and the history of the LOSRR was written by none other than Benjamin Franklin Good Kline. Mr. Kline is better known for his preeminent series of logging railroad books. Mr. Kline was connected with the Strasburg Railroad, one photo shows him firing a steam locomotive. After the Peach Bottom coal field dreams ended, the Eastern Division could be described by an unkind person as a railroad going from nowhere to nowhere with stops at nowhere in between. With no pun intended, the road existed on a diet of milk and eggs. And passengers, keep in mind that other railroads were at hand, but because the Peach Bottom was narrow guage, passengers were about the only commodity easily transloaded. The Peach Bottom became the LOSRR in the 1890's when it became involved in one the numerous battles between the Pennsylvania RR and the B&O. Lancaster city industrialists bought the Peach Bottom and ran a branch to Quarryville. By using another Lancaster short line and a proposed B&O branch from Singerly, MD to Oxford, PA, the Lancaster market would have another rail outlet. The mighty Pennsylvania retaliated by leasing the connecting short line and the financially strapped B&O never built its extention. The LOSRR was left holding the bag with even more unproductive mileage. It was a sign of the golden age of railroading times that the railroad did mangage to last from the mid 1870's to World War I when scrap value was too tempting to let the railroad continue to operate. The motorized coach above was home built by the LOSRR in its Oxford shops around 1915. 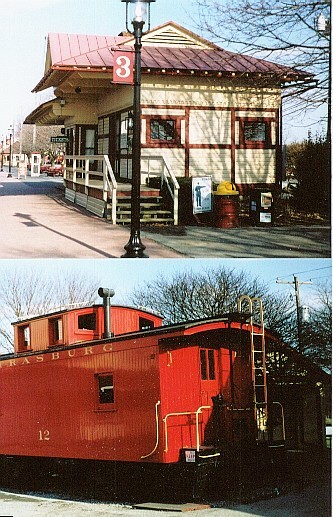 This motorized coach is shown in the Strasburg RR's literature as still running during the slow seasons. 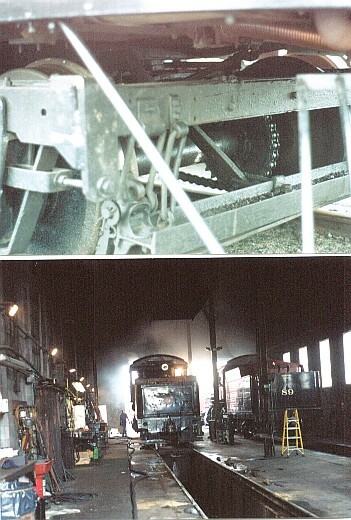 Top photo is a shot of the LOSRR motorcar's drive train. Bottom shot is activity in the shops on Saturday May 24,2003. Outside is a work in process. 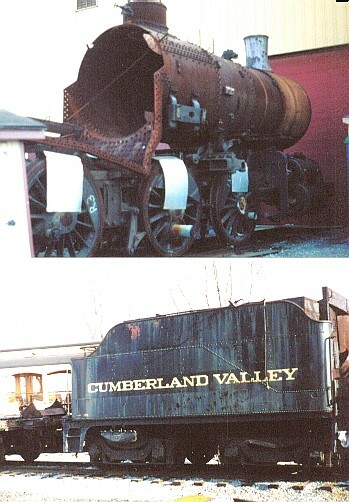 Locomotive and tender are a product of Montreal Locomotive Works and worked on a Canadian line. Nice to see Cumberland Valley on the tender. 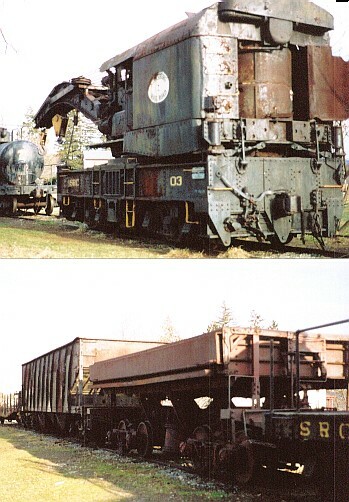 Here is Number 1, the 20-21 ton gasoline-mechanical Plymouth HL locomotive. 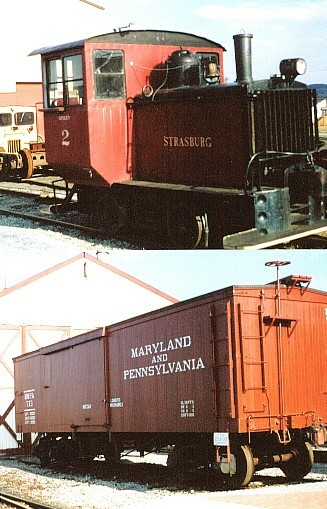 This locomotive was purchased by the original Strasburg RR in 1926 to replace steam operations and was the only power on the premises when the railroad was purchased in 1958. This locomotive was used for the tourist and freight operations until 1960 when the steam was reintroduced. Clint Chamberlin states "Plymouth was the brand name under which the J.D. Fate Company of Plymouth, OH began building gas locomotives in about 1909. It became Fate-Root-Heath in 1919, Plymouth Locomotive Works in the late 50's, and Plymouth Industries in the late 70's. 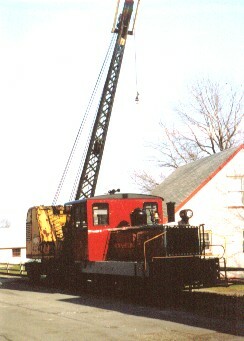 In 1999, the locomotive line became part of Ohio Locomotive Crane and the original factory was closed, with the remaining production moved to Bucyrus, OH.(1). It is now part of Williams Distribution Plymouth built is first diesel in 1927, and it has been the country's most prolific small gas and diesel locomotive builder, with 7500 to date. Most of these are small mine and industrial locomotives of less than 25 tons. They are noted for their torque-converter locomotives, and almost all later production uses that type of transmission. (1)"
Waiting at the Espenshade Road crossing, one hears the approaching train. At the same time, the sounds of horse hooves dramatically pick up speed. Turning around, you see that a young man in nice rig that has been ambling down the road is intent on beating the train to crossing. It isn't even close as the horse and buggy beat the train by a long shot.